The erstwhile British province of Coorg, later to be known as Kodagu, is a rural district of Karnataka. Flanked by the Manderi Fort to the north, welcoming you at its entrance, guarded by two life-size elephants, a Gothic-style church and the holy shrine of Omkareshwar, Coorg is a destination worth visiting. The cascading Abbey Falls provides you a breathtaking view, revealing the grandeur of the place, along with the Raja's Tomb further north, which takes you back to historical times. Monsoons are the best time to visit as the entire town blossoms with vehement greenery. Rainfall is abundant, giving you the best of the cascading gorgeous waterfalls. It is, thus, the perfect time for adventure enthusiasts as river rafting is in full swing. A hill district located on the Western Ghats, towards the southwestern side of Karnataka, Coorg is situated at an altitude of 900 m. There are three primary road routes accessible from Chennai to Coorg. Route 1 is the preferred route, covering 580 km with a beautiful ride along the historically and commercially settled places. The preferred stops along these routes reveal the beautifully carved cities and well-preserved villages. The road is in perfect condition, giving you a smooth ride all along the way. The first destination, Vellore, is located at a distance of 140 km from Chennai. The Sripuram Golden Temple located here is the world's largest golden temple! It stands as a majestic structure covered with gold foils, revealing the marvel of ancient architecture. You can even visit the Vellore Fort, which carries the memories of the 1857 mutiny, portraying the brave hearts of the first war of independence. The outside lawn is a perfect place to rest yourself while cooling down your vehicle. 174 km further from Vellore lies the industrial city of Hosur. The commercial hub is perfect to find some great local food stalls, refuelling centres and all other supplies mid-way. Hosur is also known as the Little England of India. The 500-year-old ancient Murugan Temple lies in close vicinity and is a must-visit along the way. 79 km from Hosur lies Ramanagara. The earliest rock climbing site is on the Ramadevara Betta Hill. Birdwatching is also popular for the long-billed and Egyptian vultures thrive here. One of world's largest monolith hills, Savandurga, gives a majestic view featuring granite, laterite and gneiss rocks. Your trip is not complete if you do not halt at Mysuru. It is about 98 km from Ramanagara and is the ancient city associated with the Wodeyar dynasty. The Mysuru Palace is a brief attestation to this. Mysuru is well known for its Chamundi Hills on which resides the infamous Sri Chamundeshwari Temple. Chamundi Hills is a silent spot covered in dense greenery all around and is perfect to rest for a short period while practising association with the divine being residing in the temple. Do not forget to visit the majestic palace at Srirangapatna, the palace from where Tipu Sultan ruled Mysuru. 107 km ahead of Mysuru lies Coorg. You will instantly be refreshed when the cold mist tingles your senses to the utmost satisfaction. Nestled in the Western Ghats, Coorg has well preserved its natural history, and the luscious greenery seen all around is a fine example of it. On your arrival, do not forget to try out the local dish of Coorg, the kadumbuttu and pandi curry, made up of steamed rice balls and pork with gravy. 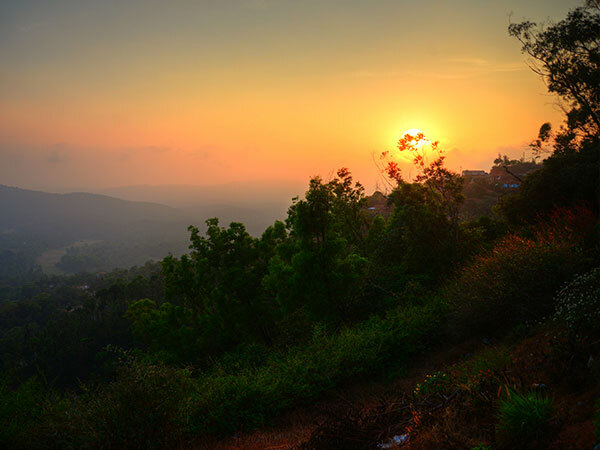 Raja's Seat in the town of Madikeri is where the kings would sit with their favourite consorts to watch the sunsets. It is considered as one of South India's most scenic locations offering breathtaking views as you gaze upon the towering hills and the green valleys. There is a beautiful garden around Raja's Seat. The historical monument, which houses the tombs of Dodda Vira Rajendra and Linga Rajendra, is at Gaddige. The commanding view of the entire town can be seen from here. These tombs are made in Muhammadan style with turrets and central domes. The window bars are also made of brass and enshrined with beautiful carvings. The medieval-style architectural building was built by Linga Rajendra II. It has a central dome and quadrangular corners with turrets. The legend says that the king had put a pious priest to death and was haunted by the spirit of the Brahmin. On advice of his divan, the raja built the temple to appease the spirit of the Brahmin. The entrance of the temple has a copper engraving that inscribes the legend. Abbey Falls is Coorg's most grand waterfall carrying the water of the Kaveri River along the steep slopes of the hills. The birthplace of river Kaveri, Talakaveri is located along the slopes of Brahmagiri hill. Talakaveri is known for its natural beauty and is also a famous pilgrimage centre. Nisargadhama is a beautiful island located at a small distance from the state highway. This 64-acre island is surrounded by the Kaveri river and can be accessed by walking across a hanging bridge. The spot has beautiful surroundings, filled with thick foliage of sandalwood, teak and bamboo groves. There are lovely riverside cottages available for accommodation and other attractions include a children's park, an orchidarium and elephant rides. Bylakuppe is a Tibetan settlement. It has several monasteries like the prominent Gompa of Sera Mey and Sera Je along with Namdroling. The Tashilhunpo Monastery is the seat of the Panchen Lama. The monasteries reflect the rich cultural heritage and diversity of the nation. The statues of Buddha are sites for deep meditation and carry uniqueness in their building styles.